San Francisco City Hall celebrates its Centennial this year. The site is included in audio tour with the American Institute of Architects San Francisco Chapter. The tour offers the chance to celebrate this resplendent Beaux Arts building designed by Bakewell & Brown. Built in 1915 as part of the “City Beautiful” movement, the city hall occupies nearly two city blocks at approximately 500K square feet. The baroque dome is reputed to be the fifth largest in the world. 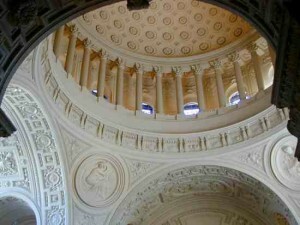 The South Light Court rotunda features medallions in its vaults with images that symbolize Equality, Liberty, Strength, Learning and Progress. Learn more in our audio tour that features other significant structures such as 140 Maiden Lane, designed by Frank Lloyd Wright, the Hallidie Building, designed by Willis Polk and residential and civic buildings by Bernard Maybeck.